Politics has often stolen the show from Hollywood at the Academy Awards. 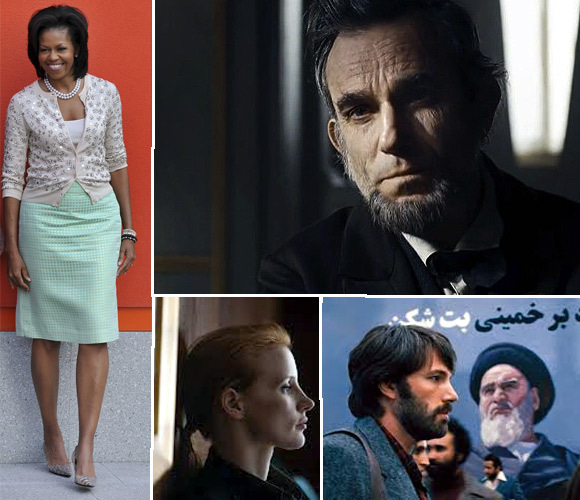 This year, several of the nominated films had political connections -- Lincoln, Zero Dark Thirty, Argo and won some top awards (Best Picture -- Argo, Best Actor -- Daniel Day-Lewis, Lincoln and Sound Editing -- Zero Dark Thirty). 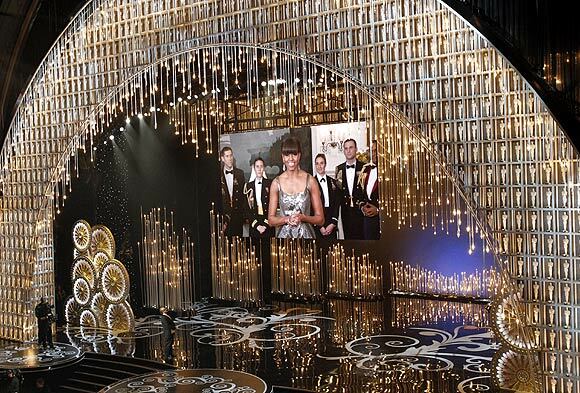 But clearly, the most-talked about moment of the ceremony was United States First Lady Michelle Obama's Oscar surprise. 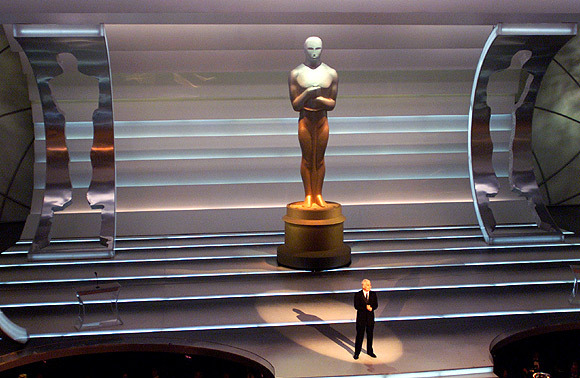 Politics has lent to the Academy Awards some of its most memorable and controversial moments, reports Politico. Here's a look at the political happenings at Dolby (Kodak) theatre in recent years. 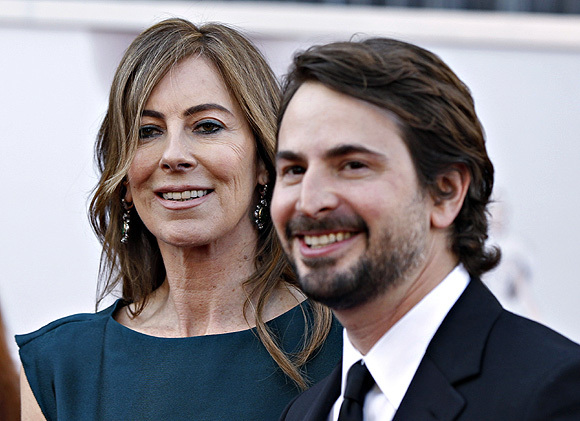 Zero Dark Thirty, Kathryn Bigelow's film on the hunt for Al Qaeda's Osama bin Laden, got more attention from the political class than it did at the Academy Awards. It was a strong contender for the Best Picture, as well as the Best Actress and Original Screenplay awards, but picked up just one award -- a shared Oscar for Sound Editing with James Bond thriller Skyfall. The movie came under fire for its depiction of torture and allegations that the Obama administration leaked classified intelligence to the filmmakers. Trouble began in December when Senators John McCain, Dianne Feinstein and Carl Levin wrote a public letter calling the film "grossly inaccurate and misleading in its suggestion that torture resulted in information that led to the capture." McCain, famously a past resident of the Hanoi Hilton, also called the film "wrong" on the floor of the Senate. The Central Investigation Agency's acting director, Michael Morell, even zapped the film in a letter to America's spooks. The first sign that this political fallout was harming the film was when its director, Bigelow, did not even win the nomination for Best Director. And on Sunday night it went home with just one award. United States first lady Michelle Obama made a surprise appearance on Sunday's Oscars telecast when she presented the award for best picture (Argo). This is the first time a first lady has ever presented an Academy Award. The surprise announcement generated a wave of 'MICHELLE OBAMA' searches, peaking at a rate of 4,500 per minute. Wearing a silver dress, Obama said this year's nominated films had "made us laugh, made us weep and grip our armrests just a little bit tighter." Obama added, "They reminded us we can overcome any obstacles if we dig deep enough and hard enough. They are especially important for young people. Everyday they engage in the arts, they learn to open their imaginations ... and strive to reach those dreams." Ben Affleck, the director and co-producer of Argo, said he felt like he was "sort of hallucinating" when Obama presented the award. 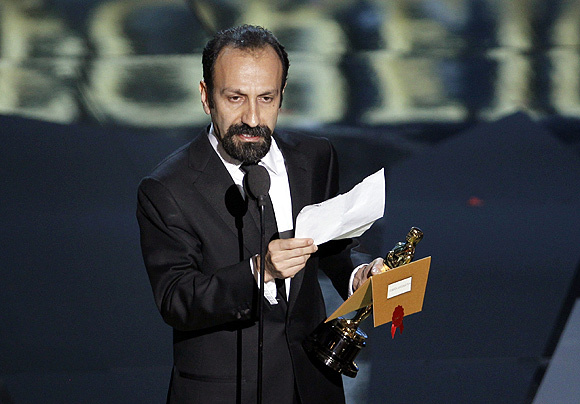 At least year's Academy Awards, Iran took home its first trophy for Best Foreign Language Film – A Separation. Asghar Farhadi, the film's director, accepted the award by thanking the Iranian people and Iran's "glorious culture, a rich and ancient culture, that has been hidden under the heavy dust of politics", Politico reports. 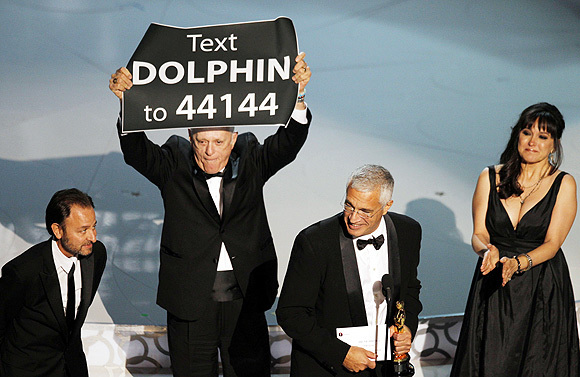 Ric O'Barry, producer of the Oscar-winning documentary The Cove,urged television viewers to text DOLPHIN to 44144 for information about the systematic killing of dolphins in Japan at the Academy Awards in March 7, 2010. ABC cut away from the stage, and the orchestra promptly played to usher the trio to the wings, writes Politico. The film analyses and questions Japan's dolphin hunting culture. Since its release, The Cove has drawn controversy over neutrality, secret filming, and its portrayal of the Japanese people. Portions were filmed secretly during 2007 using underwater microphones and high-definition cameras disguised as rocks. 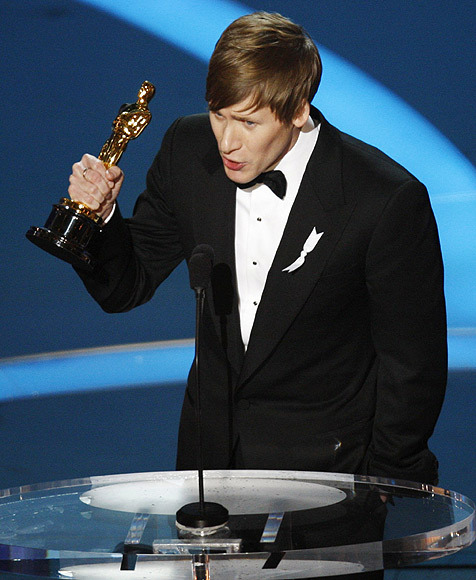 Dustin Lance Black, who took home the Best Original Screenplay Oscar for Milk, referenced the slain gay rights activist Harvey Milk in his speech, the report in Politico says. Remembering his own days as a persecuted gay teenager, Black referenced "all of the gay and lesbian kids out there tonight" and said that "very soon, I promise you, you will have equal rights, federally, across this great nation of ours." 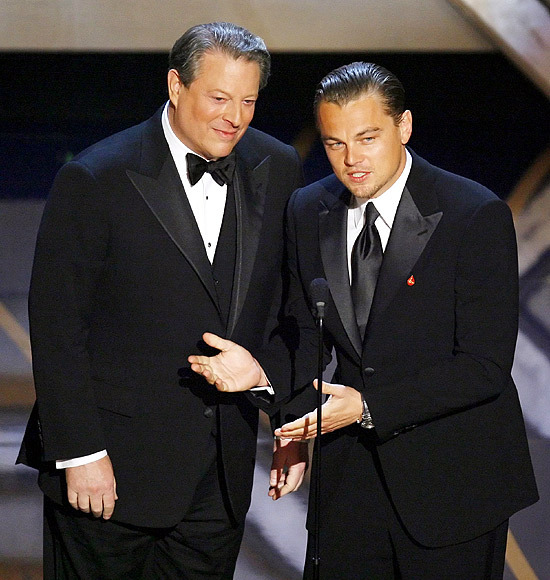 As part of what the Academy called "the green Oscars," former US vice president Al Gore and actor Leonardo DiCaprio discussed the film organisation's environmental efforts, according to Politico. "We have a long way to go, but all of us can do something in our own lives to make a difference," Gore had said. Gore then pretended to make a "major announcement" (presumably that he was running for president in 2008) before the orchestra cut him off, the report says. 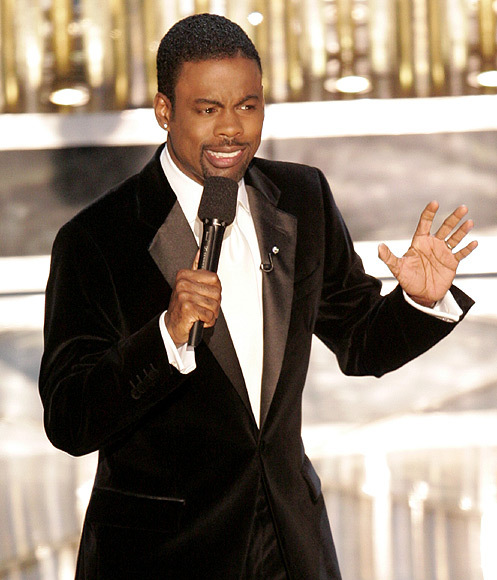 At the Oscars in 2007, host Chris Rock slammed the then president George W Bush, who was re-elected as president the year before, Politico reports. "When Bush got into office, there was a surplus of money. Now there's like a $70 trillion deficit. Now just imagine you worked at the Gap. You closin' out your register and you're $70 trillion short. The average person would get in trouble for something like that, right? Not Bush—no... ," he had said. 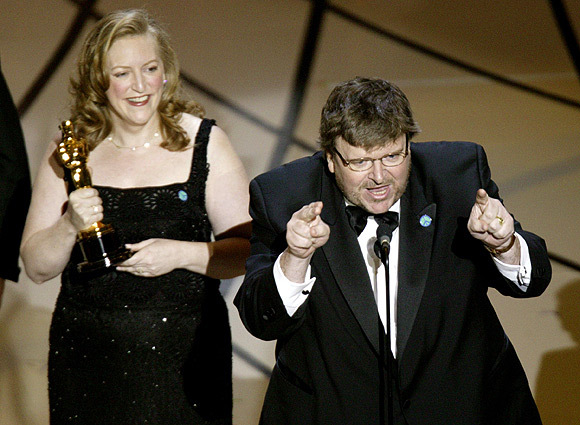 Four days after America invaded Iraq in March 2003, controversial filmmaker Michael Moore delivered a blistering speech at the award ceremony, lambasting George W Bush, according to the report. "We are against this war, Mr Bush! Shame on you, Mr Bush! Shame on you!" Moore shouted. At the 2001 Academy Awards held in March, host Steve Martin said in jest, "We live in a great country. If this [Oscar] statue were in Afghanistan, it would have been destroyed by now." He was referring to the Taliban's destruction of two 6th century Buddha statues earlier that month, according to Politico. 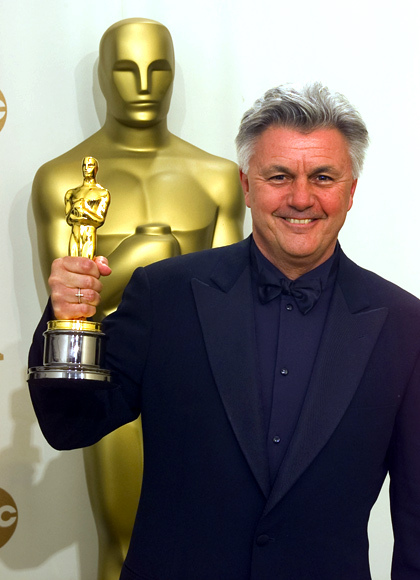 In 2000, John Irving won the Best Adapted Screenplay for adapting his novel The Cider House Rules. Anti-abortion advocates criticised the film's message, and the screenwriter acknowledged "everyone at Planned Parenthood and the National Abortion Rights League." He also thanked the Academy "for this honour to a film on the abortion subject" and Miramax for "having the courage to make this movie in the first place", Politico says.